FILE - A Terminal High Altitude Area Defense (THAAD) interceptor is launched during a successful intercept test, in this undated handout photo provided by the U.S. Department of Defense, Missile Defense Agency. China is stepping up its efforts to stop South Korea from deploying a U.S. missile defense system on its soil, turning up the pressure on the economic front, while warning of the impact on diplomatic relations if the system is put in place this year. The missile system and China’s objections are likely to be a hot topic this week during newly appointed U.S. Defense Secretary Jim Mattis’ first trip to Asia. Although U.S. and South Korean officials have long stressed that the key aim of the Terminal High Altitude Area Defense System (THAAD) is to counter North Korea’s nuclear and ballistic missile capabilities, Beijing argues that in the long run it could do much more than that. Chinese political scientist Tang Jianqun said there are two things about the system that worry Beijing: its impact on major nuclear powers such as China and Russia and how it can also function as a strategic deterrent to the People’s Liberation Army. The THAAD missile system comes equipped with a powerful radar system that China has long argued would allow the United States to see far beyond North Korea into Chinese and Russian territory. Tang said it is not just radar systems in South Korea, but those in Japan, Alaska and even in Taiwan that form part of a larger global system that concern China. THAAD is a “missile defense chain that is really part of a global system that connects both Asia and the European continent. It’s not only a system to defend South Korea from North Korea’s so-called missile threats, although it of course has that capability,” Tang said. Still, while Beijing and Washington are rivals and competitors, the relationship between the world’s top two economies is nothing like the Soviet Union and the United States during the Cold War. China and the U.S. are not in a nuclear arms race and while there are concerns that disagreements, over the South China Sea for example, could escalate, the two do not threaten each other with direct military action. 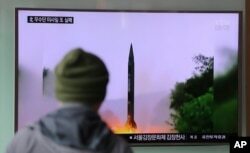 North Korea on the other hand is likely to be the biggest security challenge for the United States over the next two years, defense analysts say, with some predicting that Pyongyang could have the capability to carry out a nuclear strike on the American continent in that time. On January 1, North Korean leader Kim Jong Un announced his country was close to launching an intercontinental ballistic missile, a possibility state media said could come at any time. Despite repeated rounds of international sanctions, North Korea has maintained its nuclear and missile programs. Many critics, including President Donald Trump, have argued that China is not doing enough to halt or hold back Pyongyang’s nuclear development. FILE - A man in South Korea watches a TV news program showing a missile launch conducted by North Korea. In addition to how THAAD could become part of a global missile defense system that could be used to contain China, Beijing is also concerned the deployment of the system could hurt Beijing’s efforts to expand its influence in South Korea. When China hosted a massive military parade in 2015 to mark the end of World War II and the defeat of Japan, South Korean President Park Gyuen-hye attended along with Russian President Vladimir Putin. Since then, however, South Korea has agreed to the deployment of THAAD and Park has been impeached. An upcoming election could lead to the cancellation or delay of the system. But even so, Beijing is concerned, said Bong Young-shik, a political analyst with the Yonsei University Institute for North Korean Studies. Jagannath Panda, an analyst at the Institute of Defense Studies and Analysis in New Delhi, said there is not a debate going on in China now about how to counter THAAD, but how to counter the American presence permanently. Panda said recent revelations in the media about China’s deployment of DF-41 intercontinental ballistic missiles in the country’s northeast, near its border with the Korean peninsula, were in part a response to the possible deployment of THAAD. “The Chinese are not only, through these kinds of initiatives, passing a message to the new American president or responding to the THAAD, they are also in a way trying to pass a message to South Korea itself,” Panda said. And that message from Beijing, Panda believes is that when South Korea elects a new president, it should change the trajectory of its foreign policy and scrap THAAD. China has already begun tightening the screws on Seoul and that is likely to continue if it fails to reverse its course, Panda added. Since THAAD was deployed fewer Chinese tourists have been going to “South Korea for vacation, and that has actually in a big way already affected the South Korean economy already,” Panda said. And that is just one of the ways Beijing is taking initiatives to pressure South Korea over its deployment. Earlier this month, South Korea’s daily Hankyoreh newspaper provided a list of measures that China is said to have taken since the THAAD deployment decision went through last July, including travel restriction on Korean entertainers, charter plane flights from South Korea, and the targeting of Lotte Group operations in China. A golf course owned by the Lotte Group in South Korea’s southern Seongju County is the announced site where the THAAD system will eventually be located. It is expected to be deployed in May. Although there are concerns increased public opposition could delay it.